As you can see the interface is very reminiscent of Apple’s Coverflow in iTunes and I personally love it! 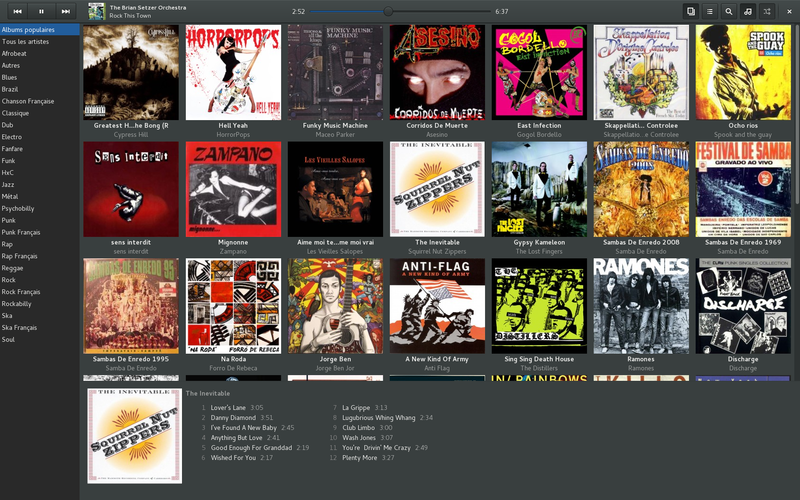 The application makes grabbing album artwork pretty easy too if you don’t have the artwork already. It looks like the application reaches out to Google images and lets you grab and apply the album artwork to your albums. I’m not sure exactly how the application stores the artwork (I’m assuming it stores it in the directory with the album but haven’t been able to confirm this yet). On top of that the media player also tracks your recently played and popular albums which makes browsing through large libraries to find your recently played and popular music quite a bit easier. Getting the media player setup was a little more of an issue then I thought it would be so I thought I would make a post on the install procedures for Arch Linux incase you’re having an issue. If you guys are having any other issues with Lollypop please feel free to ask for help and I’ll attempt to help you troubleshoot. This guide is specifically for Arch Linux however you can install Lollypop on pretty much any Linux distro but the install instructions will be a little different.